Last week, we travelled from Lucasfilm in San Francisco, California to Disney Imagineering in Glendale, and finally to Disneyland in Anaheim, to find out everything we could about the upcoming Star Wars addition to the theme parks. We’ve already taken you on a bit of a tour of the land but there’s so, so much more to talk about: The story, the technology, the food, the app, the booze, the merchandise, the teases...it’s almost incalculable. So instead—as the second piece of our Galaxy’s Edge coverage—we’ve narrowed it down to the 77 most fascinating things we saw, in honour of Star Wars’ original release year. The areas will be opening at Disneyland in Anaheim, CA this summer and Walt Disney World in Orlando, FL this fall. 1. This may have been foretold: Long before he sold the company to Disney, which in turn created a theme park, a young George Lucas went to Disneyland the first week it opened back in 1955 and often cited that trip as very inspirational in his life. 3. Rey, Finn, Poe, and BB-8 are in the park: Though it was mentioned in my last article, one of the biggest pieces of news revealed over our trip is that Rey, Finn, Poe, and BB-8 all join Kylo Ren in the ride Star Wars: Rise of the Resistance. All of the original actors reprise their roles, which are mostly on screens. 4. 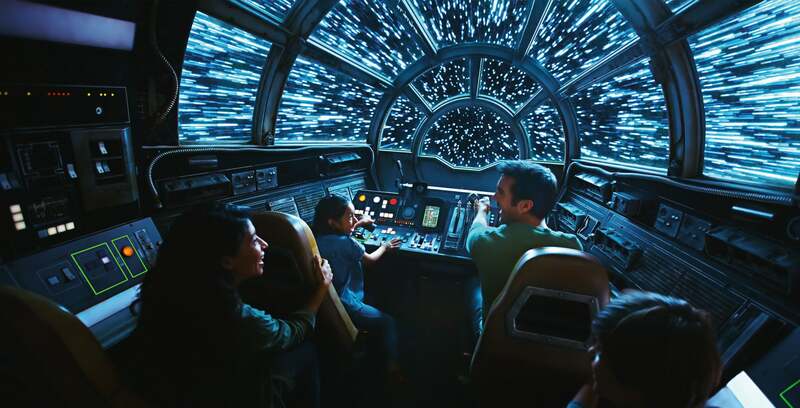 Everything happening takes place in the current trilogy: Since characters like Rey and Kylo appear in Galaxy’s Edge, the events happening here take place at some point during the sequel trilogy. However, Pablo Hidalgo, senior creative executive at Lucasfilm, explained, the planet’s history has been mapped well beyond that. “Should Star Wars jump around in time, as it is oft want to do, we know how Batuu is represented in that time frame,” he said. Concept art from inside the ride Rise of the Resistance. 7. 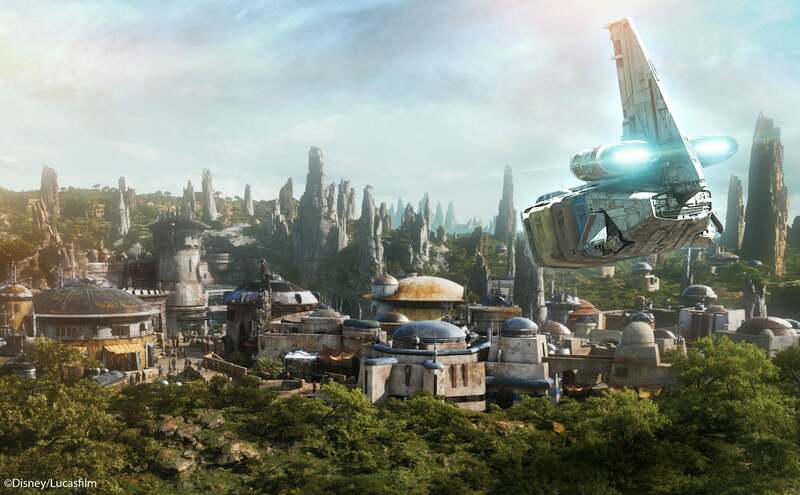 Naming the planet was one of the biggest challenges: It took over a year and hundreds of possible names before the “Batuu” and “Black Spire Outpost” were settled on. 9. 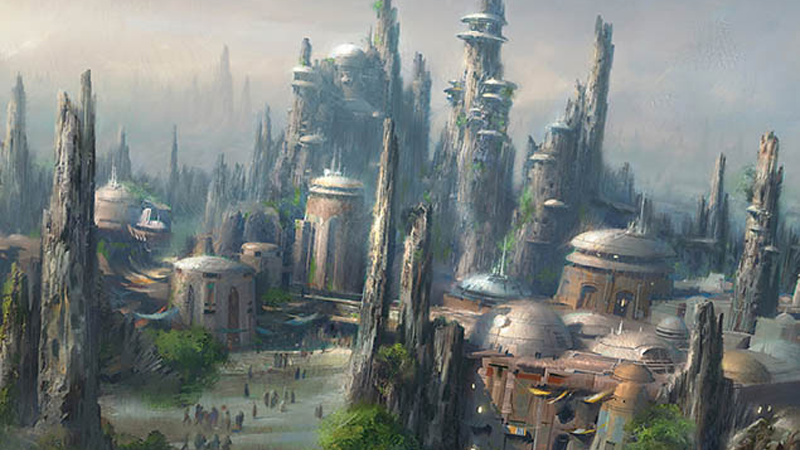 It’s called Black Spire Outpost for a reason: Batuu is a planet made up of spires, but one in particular stands out. Sitting in the middle of the outpost is one spire that’s much blacker than the rest, and that’s how Black Spire Outpost gets its name. More concept art of Black Spire, with the Falcon landing. 11. 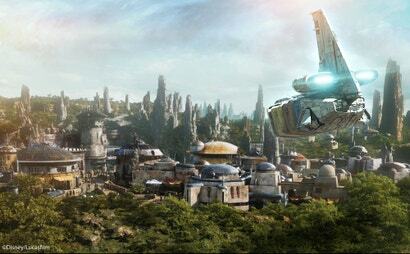 Black Spire is one of Batuu’s largest settlements: While much of what Batuu looks like remains a mystery (in case some storyteller wants to fill it in later), Lucasfilm and Disney imagine that Black Spire is probably its largest settlement and that most of the surrounding settlements are agricultural in nature. However, there are hints throughout the land of other happenings around Batuu. 12. Much of Black Spire’s inspiration was drawn from Europe and Africa: The design teams behind Galaxy’s Edge travelled to the ancient markets of Turkey, Morocco and other places in Northern Africa, and more to draw inspiration, down to the tiniest details like electric outlets, to figure out what Batuu would look like. 14. Disney has a fun way of hiding construction: Like many major movies, Galaxy’s Edge uses code names. Backstage it’s often referred to on papers and signs as the “Frontierland Expansion Project,” while the rides are given code names too: “Alcatraz” for Rise of the Resistance and “Big Bird” for Millennium Falcon: Smugglers Run. 15. Star Tours will remain: Many fans wondered if the opening of Galaxy’s Edge would mark the end of the famous Star Tours, the older Star Wars ride not located in the new section. It will not. Star Tours will live on at both theme parks. 16. This didn’t take that long: For a project of this scale, Galaxy’s Edge took much shorter to come to fruition than you may expect. The very, very first conversations were in 2013-2014, the first piece of steel was put in in 2017, and it’ll open this year in Anaheim and Orlando. 18. Pre-visualisation was massively important: Processes like building information modelling (BIM) and software like Unreal were crucial in creating Galaxy’s Edge, so that everyone involved could develop, experiment, and experience their work in three dimensions as well as virtual reality. This even extended to riding the rides. Without these technological advances, Imagineers believe the process could’ve taken double the time. 19. Playtesting is crucial: Though we didn’t get a chance to ride Smuggers Run or Rise of the Resistance, people have. Lots of them. Employees have been inviting in families and more to playtest the rides for a while now, to find out what works, what doesn’t, and more. Two examples of what your custom lightsabers may look like. 20. 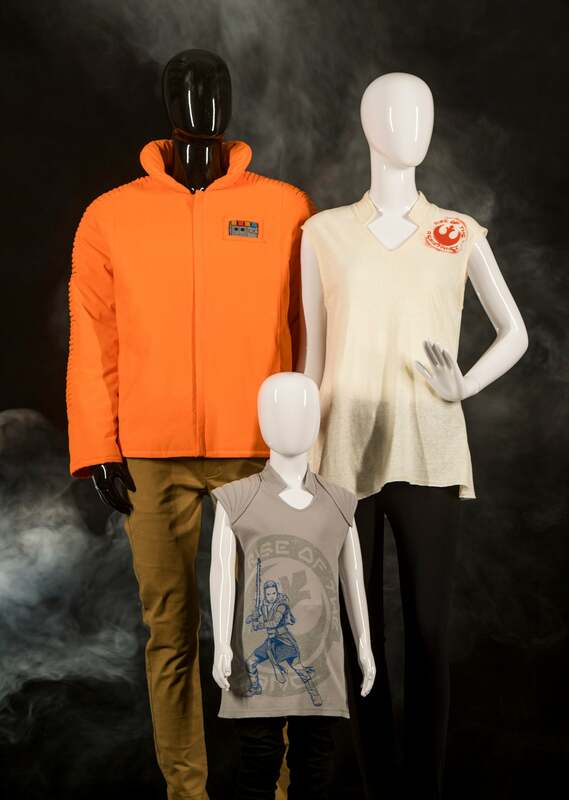 Merchandise was one of the first calls: Brad Schoeneberg, the director of merchandise strategy and new park experience development for Walt Disney World, said he first got a call to discuss merchandise for a dedicated Star Wars theme park area back in 2013. 21. There are nine primary merchandise locations in Galaxy’s Edge: Their names are Droid Depot, Savi’s Workship-Handbuilt Lightsabers, Dok-Ondar’s Den of Antiquities, Creature Stall, The Jewels of Bith, Black Spire Outfitters, Toydarian Toymaker, Resistance Supply, and First Order Cargo. Some of the toys and things you can get at Toydarian Toymaker. 22. Toydarians sell toys: While Watto from The Phantom Menace sells ship parts on Tatooine, his fellow Toydarian, Zabaka, sells handmaid toys on Batuu. This female Toydarian owns Toydarian Toymaker; there, you can buy handmade dolls, instruments, and trinkets based on famous characters Zabaka has heard about in her travels. Click through to see examples of the kinds of Star Wars oddities you can buy in Dok-Ondar’s Den of Antiquities. Here are some Sith pieces. Some Jedi merch from Dok-Ondar’s Den of Antiquities. You can even get a Jedi or Sith Holocron at Dok-Ondar’s Den of Antiquities. 23. Dok-Ondar might be the galaxy’s best Star Wars collector: One of the biggest shops in Black Spire is Dok-Ondar’s Den of Antiquities. It’s a rare antiquities shop featuring trinkets from all eras of Star Wars history. 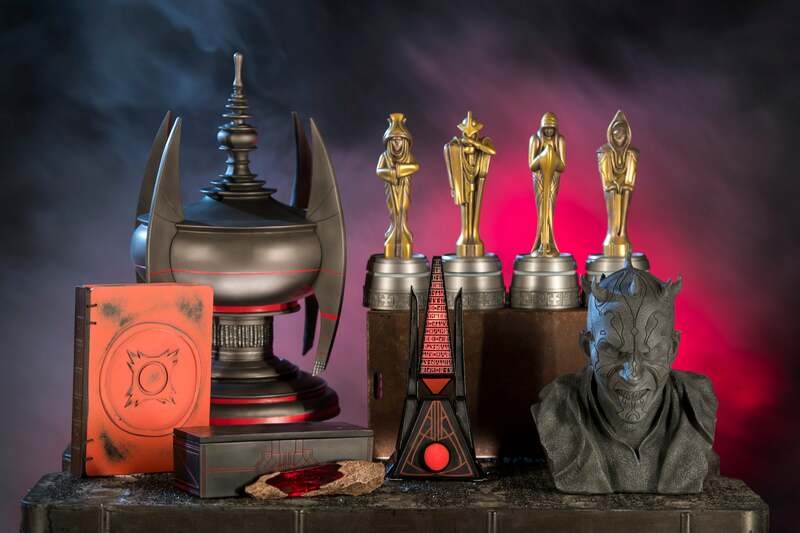 Busts, crystals, oddities, all of this and more is available at Dok-Ondar’s, who you may remember is mentioned in Solo: A Star Wars Story. 24. Dok-Ondar sells legacy lightsabers: An example of what’s sold in Dok-Ondars are legacy lightsabers. Sabers that look like ones held by all of the most famous Jedi and Sith, from Luke Skywalker and Darth Vader to Ahsoka Tano and Kylo Ren. 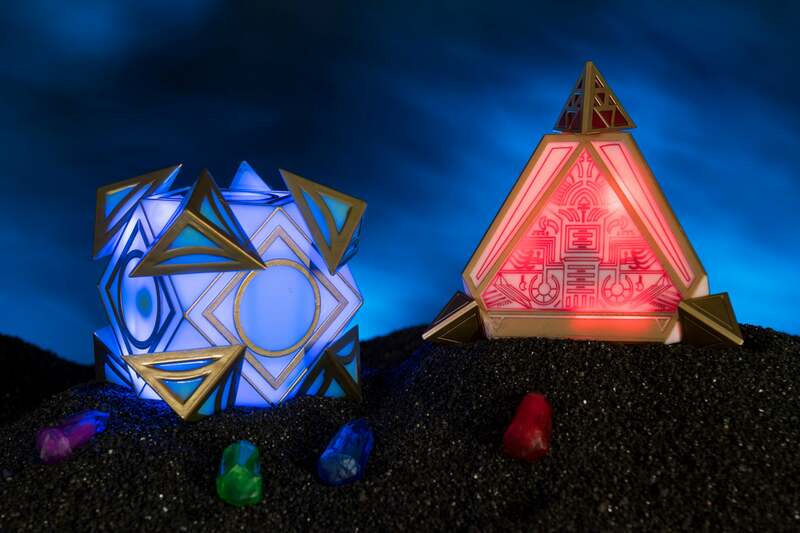 These start at about $US110 ($154) and go up based on size, and also have accessories, such as a $US50 ($70) blade which lights up, or a display stand. 25. 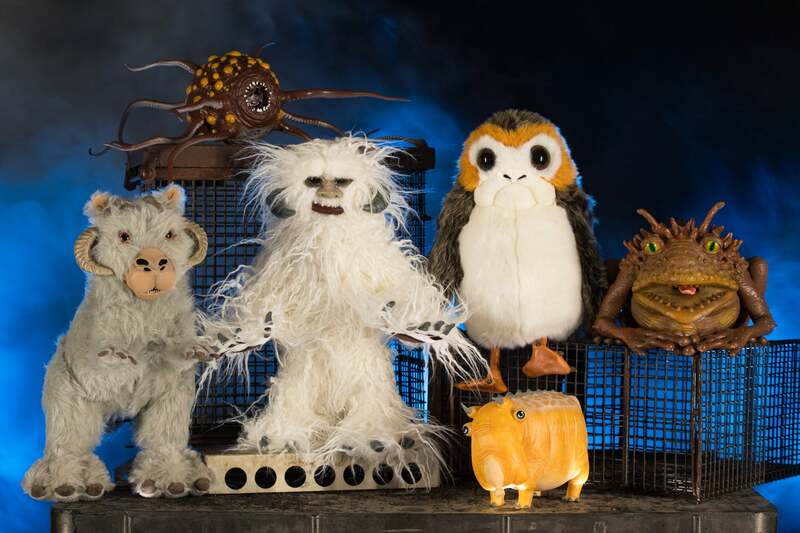 There’s a life-size wampa: Dok-Ondar’s collection will be extensive and impressive, and among its highlights is a full-size, 3.66m tall stuffed Wampa from the planet Hoth. It’s not for sale but is on display, which can also be said for a lot of his collection. There’s a whole second level of his shop that’s just cool Star Wars Easter eggs and props. 26. A mysterious statue awaits: When doing a virtual tour of Galaxy’s Edge, I noticed a large statue outside Dok-Ondar’s store. A statue of a priestess. When asked about it, Imagineering art director Kristin Makela confirmed the statue is part of Dok-Ondar’s large collection of mysterious artifacts. There’s no word exactly what, or who, she is though. 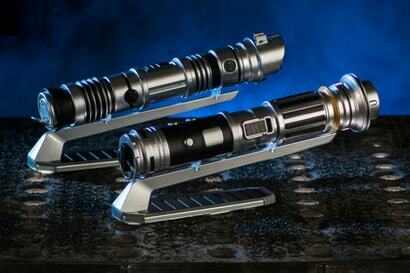 Concept art of Savi’s Workshop – Handbuilt Lightsabers. 27. Make your own custom lightsaber: We detailed this a bit in the previous article, but Savi’s Workshop – Handbuilt Lightsabers is a special stand where park visitors can build their own lightsabers. They’ll choose one of four disciplines: Power and Justice, Power and Control, Elemental and Nature, or Protection and Defence. Then you’ll choose your kyber crystal. And, based on those two choices, you’ll get a specific set of 10 lightsaber pieces that can be combined in any way, resulting in your very own custom lightsaber. Logistics have not yet been settled on but this may, in fact, be a reservation experience since only 14 people at a time can do it and it takes around 15 minutes total. The Droid Depot, in concept art form. 28. Build your own droids: Like the lightsabers, there will be a store where guests can build their own droids. 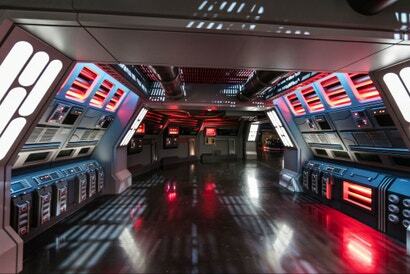 It’s called the Droid Depot and it’s run by a character named Mubo. 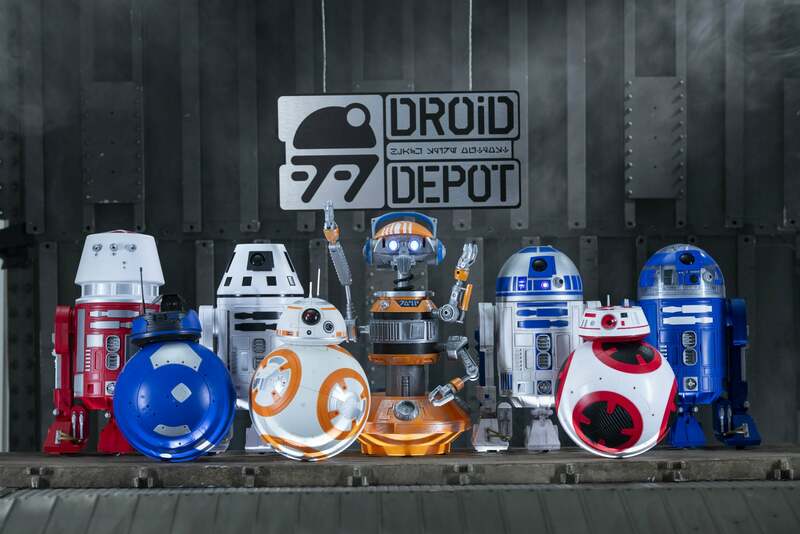 After choosing if you want to do a BB or R-series droid, you pick custom pieces, colours, and accessories to create your personalised dream droid. That droid will then be fully radio controlled and, if you guide it around Black Spire outpost, it can interact with many of the elements. There are also premade droids, like R2-D2, BB-8, and even DJ R-3X (more on him below). Examples of the droids at Droid Depot. 29. No blasters: Though blasters are a large part of the Star Wars franchise and are included in many attractions (Dok-Ondar has an impressive collection, as one example), as per Disney policy, no guns are for sale in the park, and that goes for Batuu as well. Some of the offerings in the Creature Stand. 30. 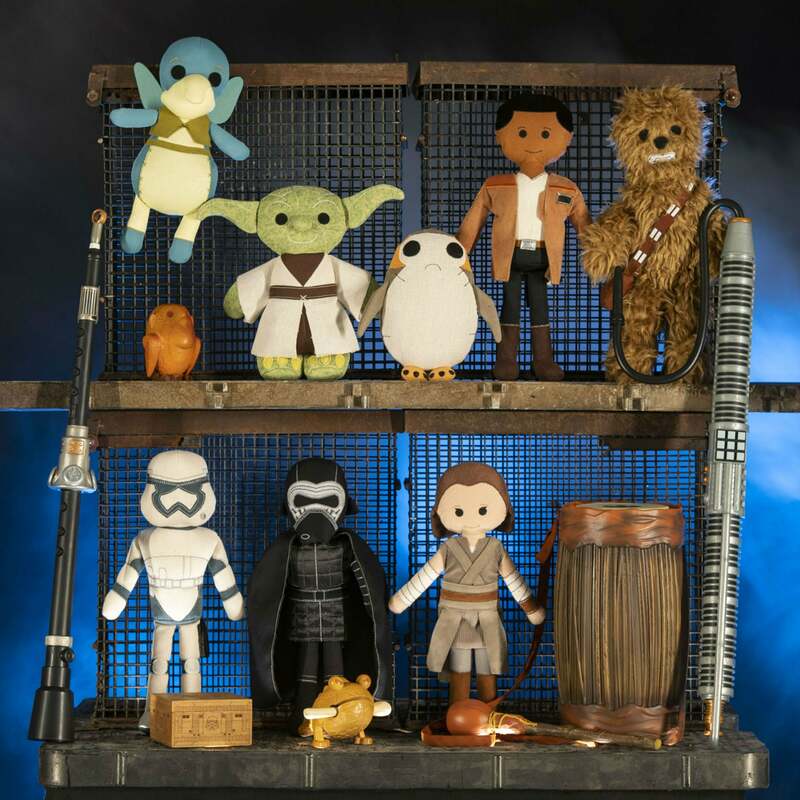 Buy adorable animals: Have you ever wanted to own your own tauntaun, porg, or rathtar? You can do just that at the Creature Stand. An alien named Bina has travelled the galaxy and now sells toy versions of all those creatures and more, many of which are interactive and react when you pet them. Oh, and watch out for the animatronic Lothcat sleeping inside. 31. No “Disney” stuff: All the merchandise in Galaxy’s Edge is as if you bought it on Batuu. You can’t just buy generic “Disney” or “Star Wars” items here. 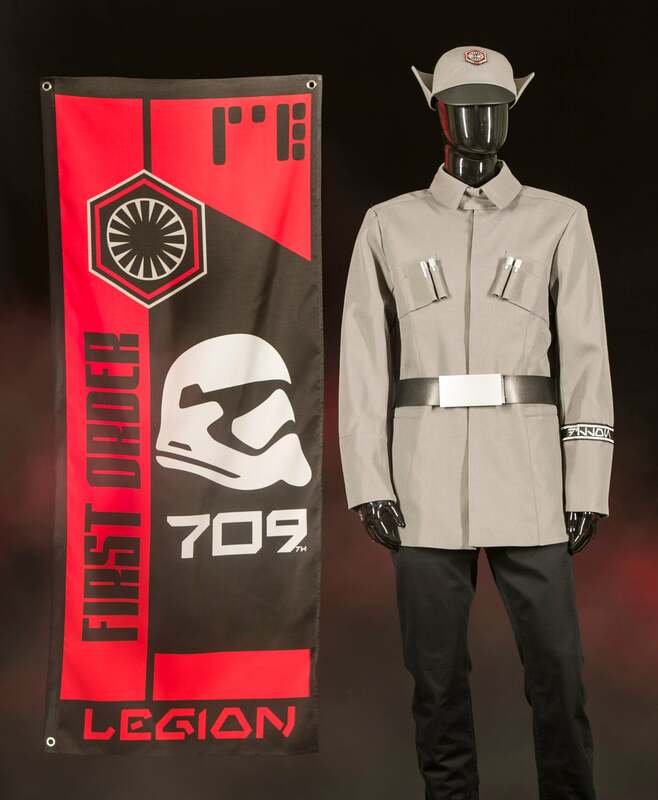 An example of First Order merchandise. 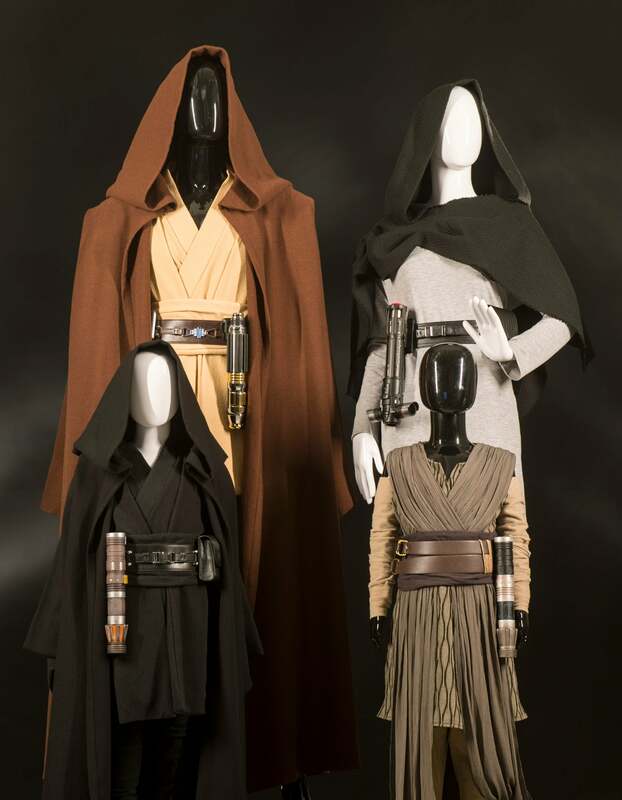 Some Jedi robes from Black Spire Outfitters. A family full of Resistance gear. 32. Clothing stores vary by location: Three clothing stands sell pieces based on where they are in the outpost. Black Spire Outfitters is in the marketplace and sells robes, Resistance Supply is in the forest area and sells Resistance gear, and First Order Cargo is in the First Order section and sells their clothing. 33. 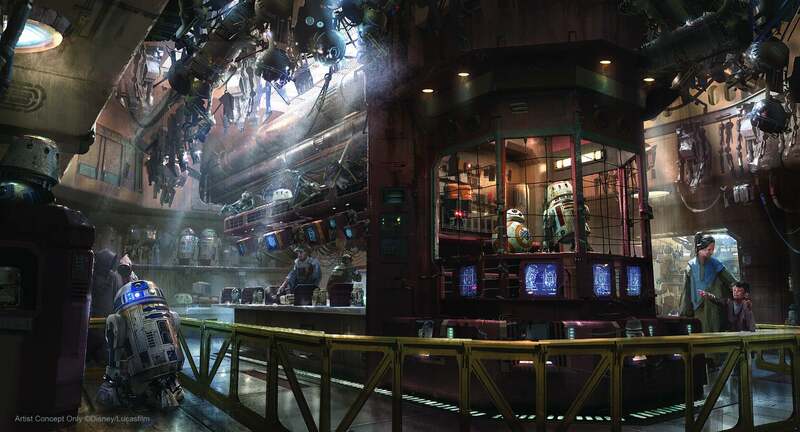 There are five main food stands: They’re called Oga’s Cantina, Docking Bay 7 Food and Cargo, Ronto Roasters, Milk Stand, and Kat Saka’s Kettle. 35. Star Wars food is defined by bold choices and tastes: That was the mantra for everyone developing the food and drinks. Be big. Be different. “If it looks like one thing and maybe tastes like something else? That could be really cool,” Piasecki said. 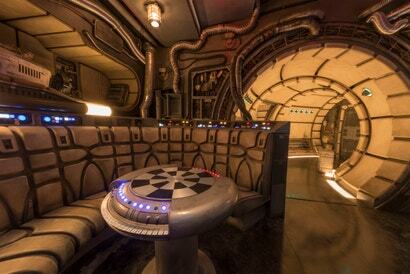 “The flavours in Galaxy’s Edge and Docking Bay 7 are going to be very bold,” he added. 36. 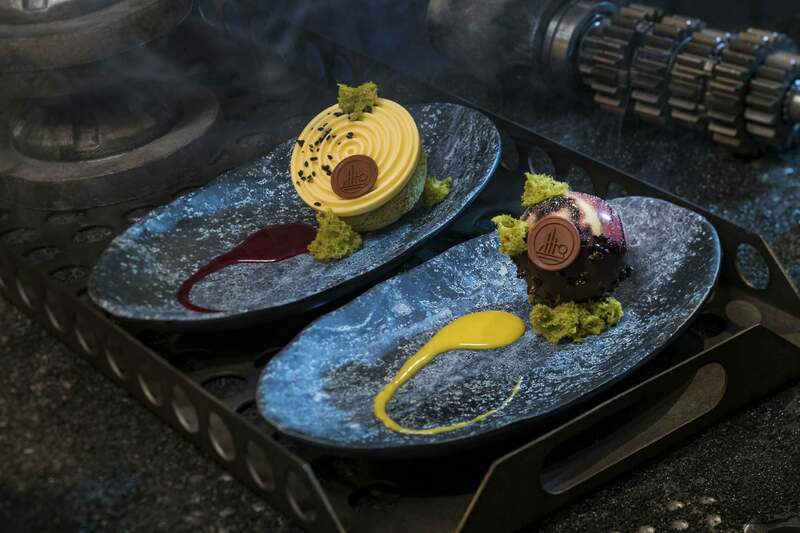 Planets inspired much of the food: Star Wars planets are very distinct and the chefs drew ideas for possible ingredients by imagining the kinds of vegetation or spices that could have come from planets like Endor, Crait, Tatooine, etc. 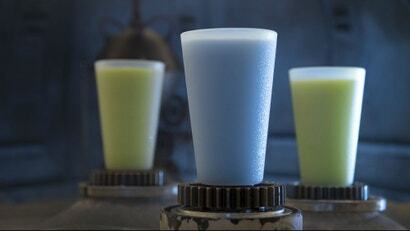 Blue (and green) milk now exists. 37. They invented blue milk: There couldn’t be a Star Wars land without Star Wars’ most famous beverage, blue milk, and Galaxy’s Edge will officially unveil what that is to the world. But there was a problem. Galaxy’s Edge exists in Southern California and Florida, and milk is about the last thing you want to drink in those warm climates. “It’s not actually milk,” Trowbridge said. Instead, it’s a plant-based dairy creation that’s almost a frozen smoothie with berry and melon flavours. 38. There’s also green milk: While developing blue milk, something happened. “Scott [Trowbridge] came to us and said ‘In a new movie coming out, you’re going to have to create something else,’” explained Brian Koziol, the food and beverage concept development director for Walt Disney World. “And that became our Thala-siren green milk that showed up on Ahch-To.” It’s also a frozen drink and has tropical flavours. Both it and the blue milk are primarily available at the Milk Stand. 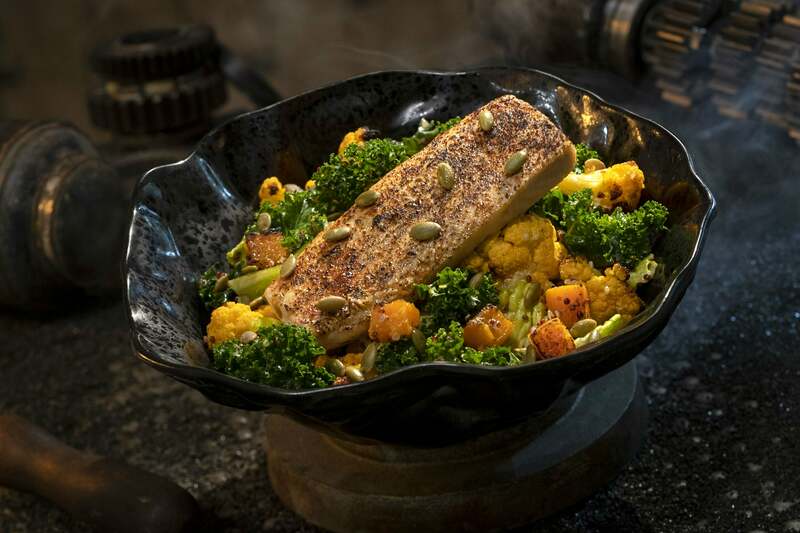 Click through to see examples of the exotic Star Wars food in Docking Bay 7. First up is this Fried Endorian Tip-Yip, a chicken dish served with roasted vegetable mash and herb gravy. This is Ithorian Garden Loaf, a plant-based “meatloaf” dish served with roasted vegetable mash, seasonal vegetables and mushroom sauce. 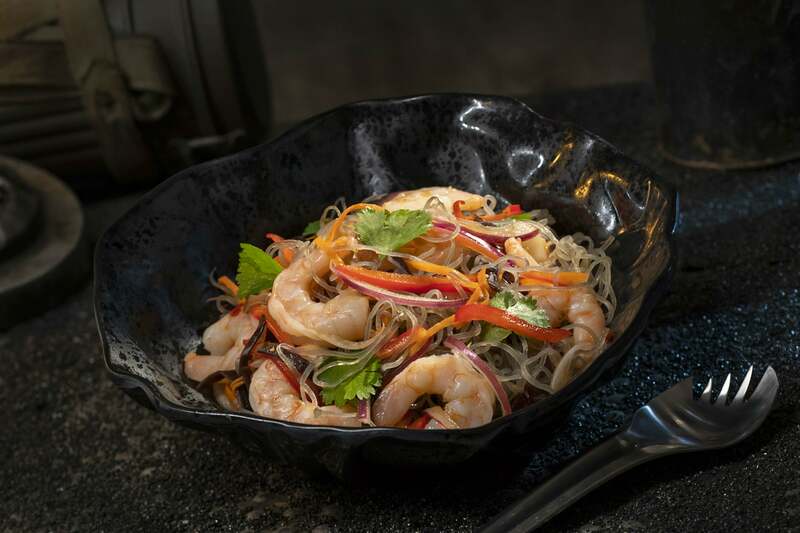 The Yobshrimp Noodle Salad is a marinated noodle salad with chilled shrimp. Felucian Garden Spread is a plant-based kefta “meatball” dish with herb hummus and tomato-cucumber relish with pita bread. These desserts haven’t been named yet, but one on the left is a raspberry crème puff with passion fruit mousse and the other is chocolate cake with white chocolate mouse and coffee custard. 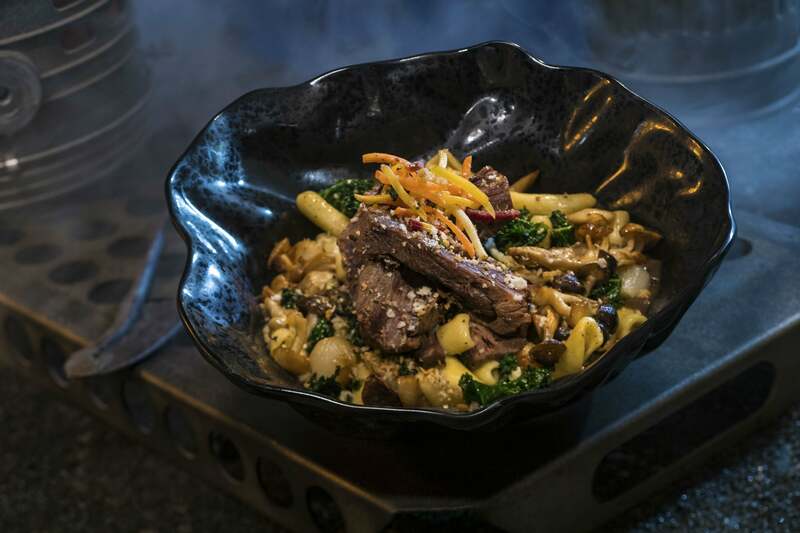 Braised Shaak Roast features beef pot roast with cavatelli pasta, kale, and mushrooms. 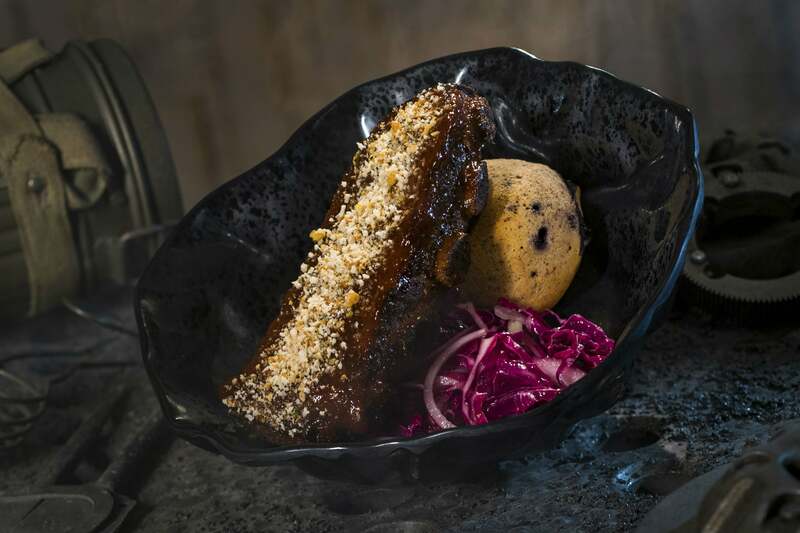 Smoked Kaadu Ribs are smoked country sticky pork ribs with blueberry corn muffin and cabbage slaw. Smoked Kaadu Ribs - Basically a pork rib, but cut in a unique way and served with a blueberry corn muffin. And yes, in story, it’s the rib of the Naboo native Jar Jar rides in The Phantom Menace. Fried Endorian Tip-Yip - Tip-Yip is Star Wars chicken. And here’s its prepared in a unique bar shape, with a distinct crust, and served over vegetables. Yobshrimp Noodle Salad - A fancy name for a chilled noodle salad with shrimp. Of everything we tasted, it was my least favourite thing. Felucian Garden Spread - The primary vegan dish is plant-based “meatballs” with hummus, relish, and pita. 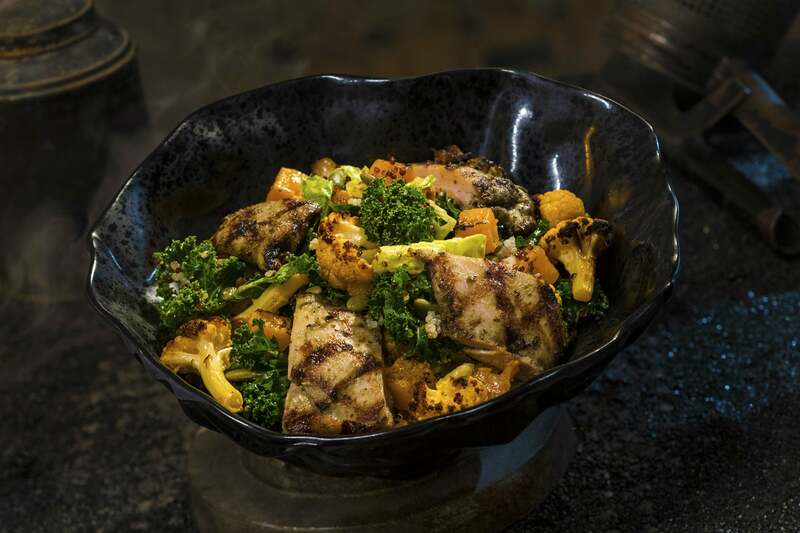 Oven Roasted Burra Fish or Roasted Tri-Yip - Both served over vegetables and considered more the “healthy” options; you can get roasted fish or chicken. 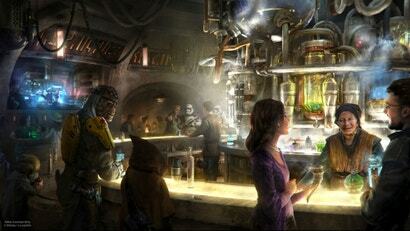 Concept art of Oga’s Cantina, including DJ R-3X on the right side. 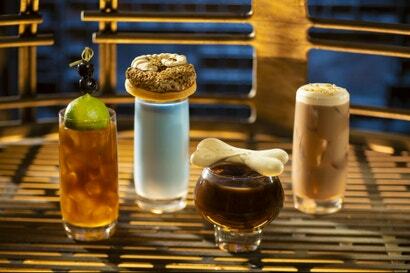 Left to right, the Outer Rim, Bespin Fizz, Yub Nub, and Fuzzy Tauntaun drinks from Oga’s Cantina. Black Spire Brew - Which is like a spicy coffee. Blue Bantha - The chilled, more milk-like version of Blue Milk, which comes with a cookie that looks like a bantha. Cliff Dweller- A kind of ginger ale fruit punch. Carbon Freeze - Which fizzes on its own. 41. Beers and wine will be exclusive to Galaxy’s Edge: Disney worked with several breweries and winemakers to create beers and wines guests will only be able to drink, ever, in Oga’s Cantina in Star Wars: Galaxy’s Edge. Some examples are as follows: Bad Motivator IPA, White Wampa Ale, Spiced Rutter Cider, Imperial Red Cab Sav, and Toniray White from Alderaan. 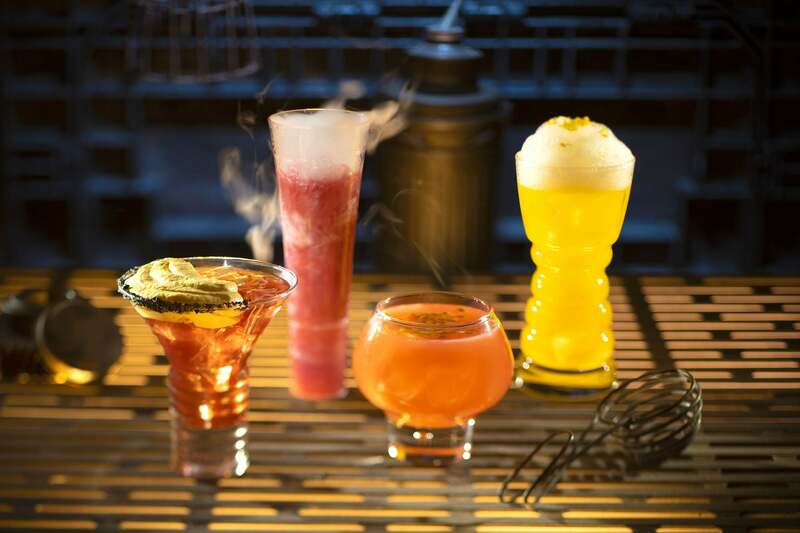 Carbon Freeze, Oga’s Obsession, and Cliff Dweller, all found in Oga’s Cantina. 42. 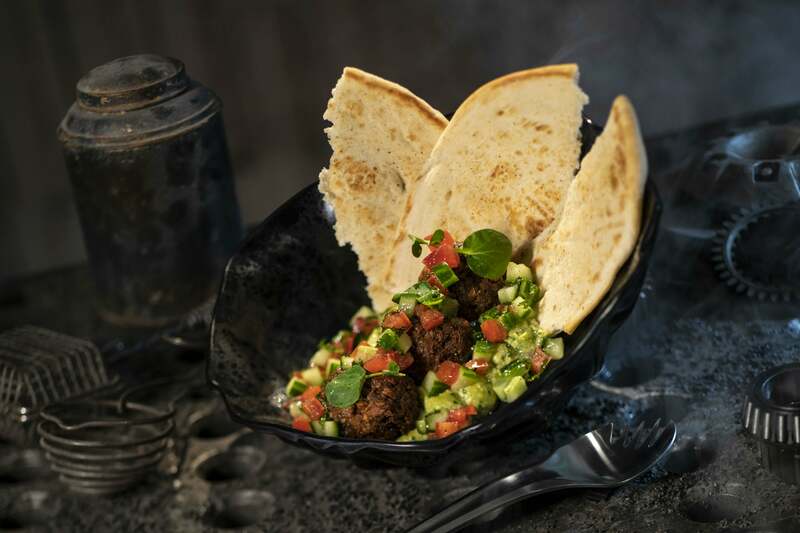 Order Oga’s Obsession: In all my tastings from all the menus of Galaxy’s Edge, the one that truly stood out with a small plate called Oga’s Obsession which is served in the Cantina. It’s hard gelatin with little bubbles in it, served in a petri dish, topped with dried fruit and pop rocks. It’s surprising, weird, and delicious. 43. Padme’s order is on the menu: How much detail is paid to these things? 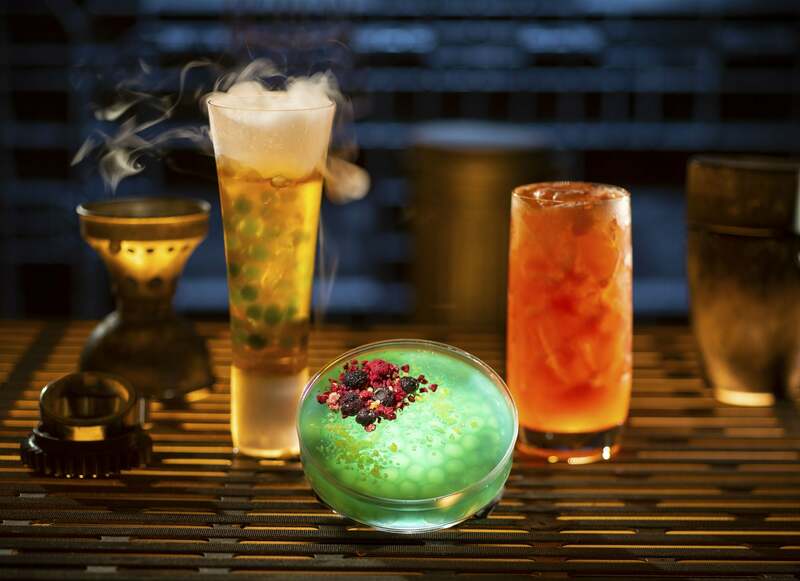 In the book Thrawn Alliances, Padme visits the cantina on Black Spire Outpost on Batuu and orders Andoan White wine off the menu. 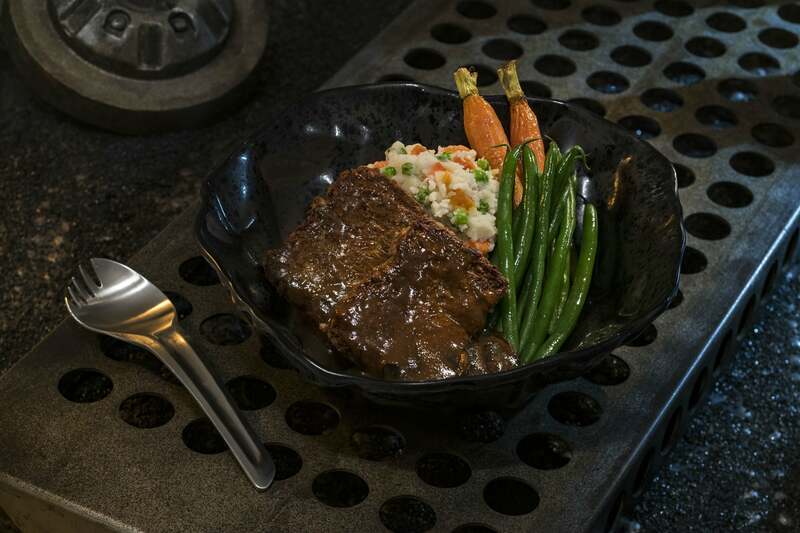 That, of course, is also on the menu at Oga’s Cantina in the park. Concept art of Ronto Roasters. Click through to see the Ronto Wraps. 44. 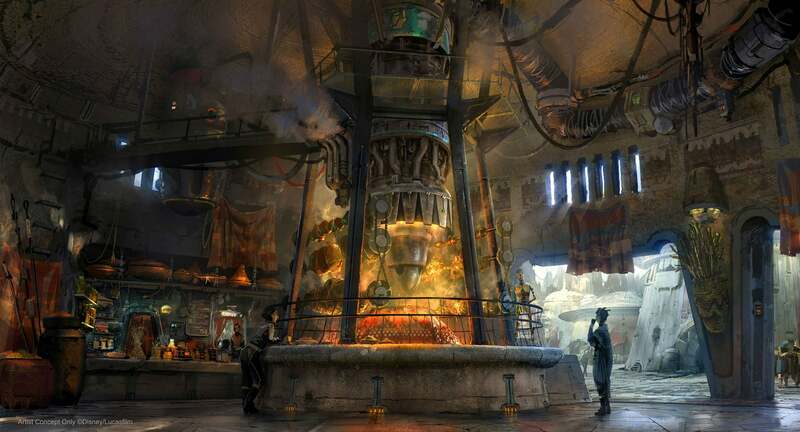 Eat space meats made on a podracing engine: One of the primary eating establishments in Black Spire Outpost is Ronto Roasters, run by a character named Bakkar (along with his droid 8D-J8). 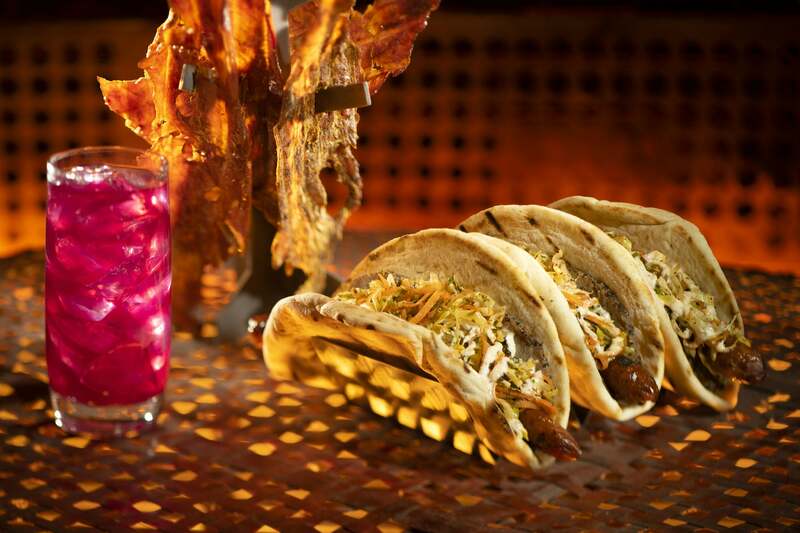 It serves a sausage wrap, non-alcoholic beverages (named Tatooine Sunset, Sour Sarlacc, and Meiloorun Juice), as well as two flavours of turkey jerky: sweet teriyaki and spicy herb. 45. 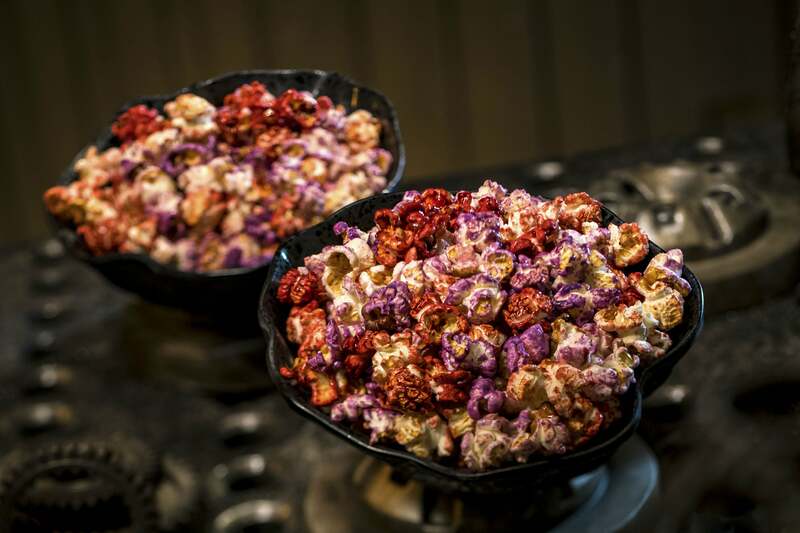 Enjoy colourful Star Wars popcorn: Kat Saka is a local Batuu farmer who collects spices from around the galaxy. Those spices then get used at Kat Saka’s Kettle, which a special Star Wars popcorn called Outpost Mix in various bright colours that offer sweet, salty, and spicy bites. Bold flavours, remember! 46. 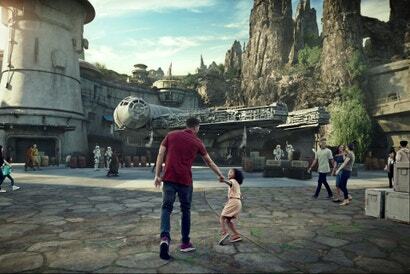 John Williams’ music won’t be used how you think: Since Galaxy’s Edge is a “real place,” not a theme park, the new music John Williams’ wrote won’t just be playing outside. Star Wars music doesn’t just play in the world of Star Wars (mostly), you can expect it on the rides right when it should be. 47. The dianoga has a cheeky cameo: The dianoga, also known as the gross snake creature from the trash compactor in A New Hope, appears in the land. It’s hiding inside a tube above a water fountain and pops out when people drink from it. The tube is filled with what looks like gross water, which isn’t feeding into the fountain but is meant to look like it does. 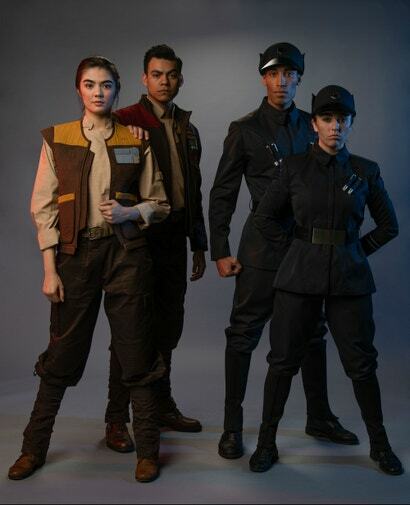 Cast members who work for the Resistance as well as the First Order. 49. 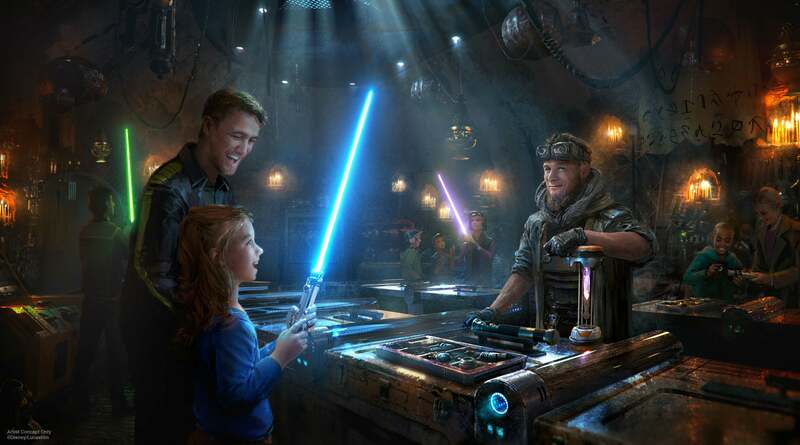 The costumes will be a Disney first: For the first time in the history of Disney theme parks, cast members who work in Galaxy’s Edge not only will be able to develop personalities, they’ll be able to express them by picking their own outfits from a curated wardrobe of all kinds of different fabrics, layers, and accessories. 50. 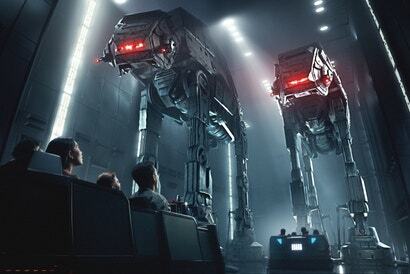 Both rides will offer multiple experiences: We’ve detailed the ride experiences extensively in the previous article but an interesting note beyond that is that neither is always the same ride. Depending on how your six-person crew works together on Smugglers Run, the ride will change slightly—and it was confirmed, but not explained, that Rise of the Resistance has different variations as well. 51. Look out for droid tracks: If Black Spire Outpost has been around for generations, odds are there would be droid tracks around. So to achieve that, the team went to Lucasfilm to find the original R2-D2 from A New Hope, got a mould of his tracks, and then transposed that to a device which was spread all over the park to add some authenticity. Walking around the Black Spire Outpost, you never know what you may find. 52. The app is basically a third ride: If you aren’t riding on one of the two main attractions, Disney hopes you will be using its Play Disney Parks app to have unique time in the park. From the lines to the stores, walkways, and more, the app unlocks new experiences at every turn. The whole thing was built and wired to be interactive from day one. 53. Hack, Scan, Translate, Tune: Those are the four tools in the Star Wars section of the app, and through those tools, guests will be able to do those things around the land. 54. Accept all kinds of jobs: One of the four menus in the app in a job board. There, a huge variety of different jobs (aka games) are available, from ones that take seconds to some that can take much longer. Each will require you to walk around with the app, use your tools, and complete tasks. 55. Keep your head up: Disney doesn’t want a bunch of people just walking around with their heads in their phones. So all of the jobs in the app require you to look around. You’ll be exploring, searching, and then finally using the phone to complete things such as translating text, scanning crates, and more. Always look up. You never know what you may see. 56. Don’t worry about wifi: Though you’ll need wifi to download the app, the app’s main functions are all designed to use Bluetooth and location services. You can enjoy them offline. 57. The main game is always happening: Though you can complete jobs on your own (or with your group), the app also has a (still-untitled) main game that’s constantly running. It’s a lot like the popular game Ingress, where people side with either the Resistance or First Order and compete with others in the area to acquire land. The game evolves and speeds up, or slows down, depending on how many people are playing. 58. Everything in the app is also canon: You’re on Batuu, which exists in the Star Wars universe. So any events that happen in your app are actually happening in Star Wars and could, hypothetically, be referenced in other works. 60. You choose your allegiance indirectly: Everyone using the app will be categorized as either Resistance, First Order, or Scoundrel...but only after you’ve done enough tasks to prove yourself. You’re judged by your actions, not by the click of a button. 61. The app will be updated: Completed all the jobs? Hoping for something new? The app will be updated to keep it fresh, though it’s unclear just how often and how significantly. 62. Dok-Ondar is an animatronic, interactive character: Dok, a 245-year-old Ithorian, will always be in his store, moving around, and working in his very own booth. He was designed by Imagineering to be on almost a randomised playlist of motions so you’d rarely see the same actions twice. Plus, if you ask a nearby cast member to help you, they will haggle with him for you. 63: Dok’s responses change based on his mood: Another way Dok-Ondar’s motion is randomised is that he can be either “Happy” or “Frustrated” based on events of the day. That changes the actions he does and the tone of his responses. 64. They needed a pirate: Of all the Star Wars characters that could have been the main character of Smugglers Run, why did they pick Hondo? “We needed a pirate,” Beck said. “And when you need a pirate there was one person who came to mind, Hondo Ohnaka.” He’s again voiced by Jim Cummings from Star Wars: The Clone Wars and Star Wars Rebels. 65. Hondo is the second most advanced animatronic character in Disney history: Disney has a long history of impressive animatronics, from Abraham Lincoln in 1964 up to the Na’vi Shaman currently at Pandora in the Animal Kingdom park in Florida. And while the Shaman is still the most advanced animatronic character ever, Hondo is a close second, with about 50 unique motions and functions. A zoom in of the Oga’s Cantina concept art to reveal the DJ. 66. 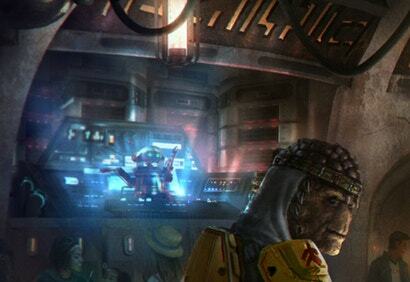 R-3x has been reprogrammed: R-3X , the pilot of the original Star Tours, somehow ended up in Oga’s Cantina in Black Spire Outpost on Batuu, as a DJ. He’s since been reprogrammed to perform that action and is still voiced by Paul Reubens. 67. There are three hours of R-3x music: Unless you stay in the Cantina all day, you’ll probably hear new music from DJ R-3X. He has about a three-hour loop broken into one-hour segments. Each hour has some similarities, so they aren’t wholly unique, but each hour-long program is different. 68. R-3x’s music is eclectic and new: “R-3X is a radio DJ so he’s pulling music from across the galaxy,” said the executive creative director for music at Disney Imagineering, John Dennis. So while there will be some traditional, John Williams cantina influence, he’s largely playing what Disney thought Batuu pop music might be. For example, when we saw and heard R-3X , he was playing what could only be described as “Jawa Hip Hop,” with a thick beat under all the “Utinnis” you can handle. 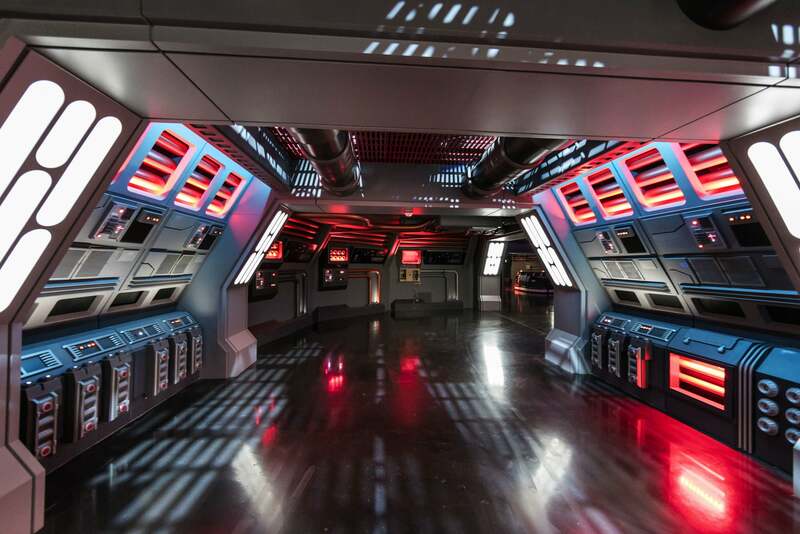 A look in one of the hallways on Rise of the Resistance. 69. 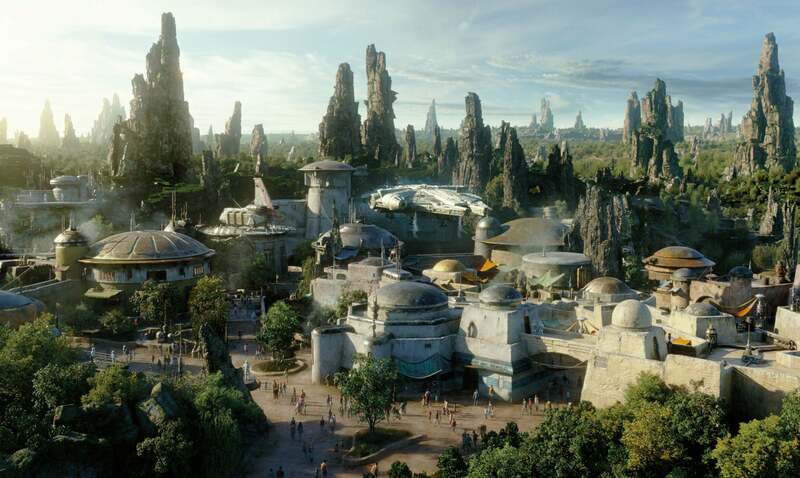 Orlando and Anaheim almost identical: It’s important to never lose sight that Galaxy’s Edge is coming not just to Disneyland in Anaheim, CA, but to Disney’s Hollywood Studios in Orlando, FL. And, aside from a few things, these lands will be almost identical. “Not every single detail is exactly the same,” Trowbridge said. One example is that “the quality of sunlight is different in California, so the paint and colour palette is a little bit different because of the way the lands hit the light,” he said. Also, the entrances are different. But beyond that, when you’re in the planet, it’s almost identical. 70. The props are everything: “In the movie business there’s the line, ‘We’ll fix it in post,’” said the portfolio executive producer for Imagineering, Robin Reardon. 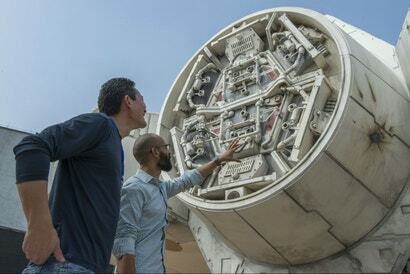 “In theme parks it’s, ‘We’ll fix it with props.’” By the time Galaxy’s Edge opens there will be tens of thousands of props specially created for the land, many of which were specifically created only with materials that were available before 1980, to keep the aesthetic of the original trilogy. Sometimes that was impossible, other times it was not. All that stuff that makes the Falcon look so real? Props. 71. 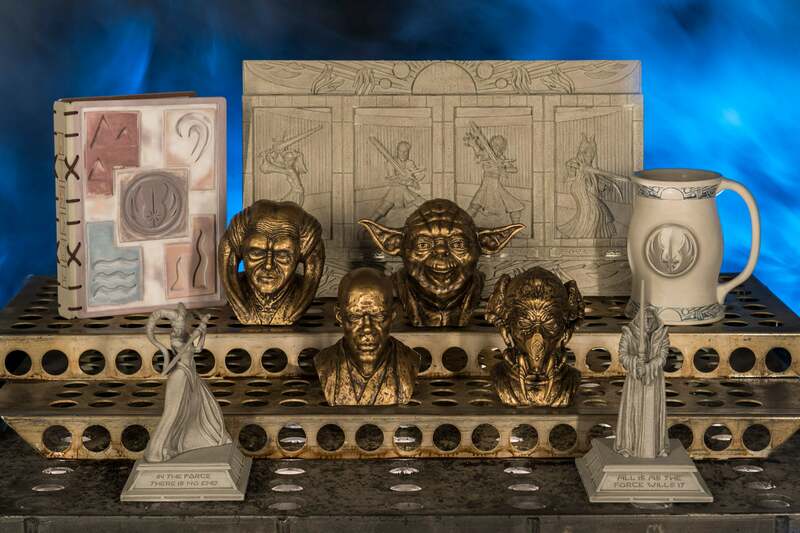 Lucasfilm’s archive was a great resource: In as many instances as possible, the prop department used original Lucasfilm molds for everything imaginable from the merchandise like lightsabers, to ships, surfaces...everything. 72. 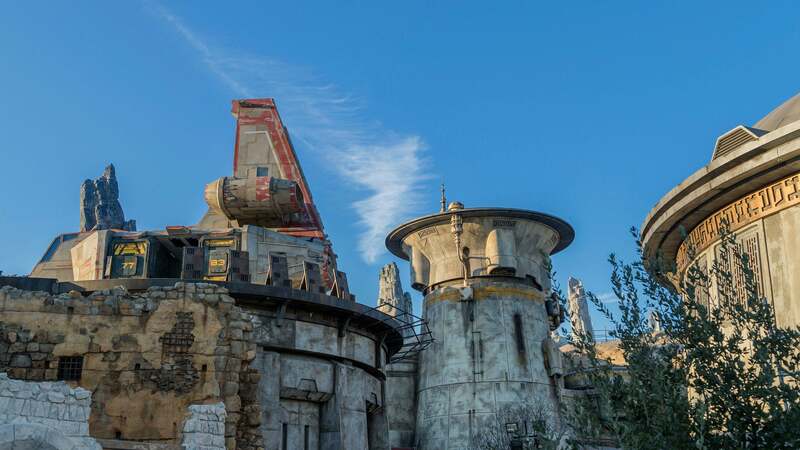 Everything is set a little higher on purpose: As you walk through Galaxy’s Edge, you may notice many things are a little above eye level. That was done on purpose, in anticipation of it almost always being very crowded. 73. There’s a “Hidden Hidalgo:” One of the favourite Easter eggs for the people at Lucasfilm is that creative executive Pablo Hidalgo’s voice is used somewhere in the land. He’s one of many, many, many Easter eggs hiding everywhere in the Outpost. 76. There are teases from future films: We were told that somewhere in the park there were new teases, and specifically vehicles, from new films (presumably Episode IX). Whether that’s the TIE Echelon described in my previous article or not, we don’t know. And other things we probably won’t know until after the movies are released.